My Artprize deadline is less than two weeks away, so I’m in continuous work mode and really looking forward to taking a serious break in a couple weeks. 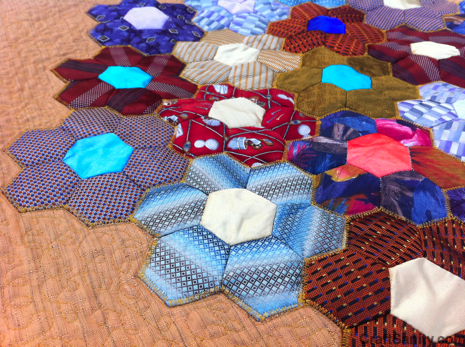 I worked until 2:30 a.m. this morning free-motion quilting the first quilt panel. I thought I was done when I went to bed only to wake up this morning and see that I needed to do a more quilting on the applique part of the quilt. Shoot! I’ve since moved on to panel two and hoping that one goes faster than panel one. (So far it is!) Weaving in the thread tails is the most tedious part of this process, but I’m getting super fast at that part, too. And a big thumbs up for Fusi-Boo fusible batting. It has saved me a ton of time and is very easy to work with. Don’t turn on me now, Fusi-Boo! Time to quilt. More soon. P.S. Here’s today’s craft column that I previewed earlier this week. I will post more about how to weave with pine needles after the quilt marathon is over. In the meantime, check out the links in my previous post. Fusi-Boo: A Quilter’s Friend or Foe? you are truly a excellent webmaster. The web site loading velocity is amazing. It kind of feels that you’re doing any unique trick. In addition, The contents are masterpiece. you have done a great activity in this matter! Hey there! Quick question that’s completely off topic. Do you know how to make your site mobile friendly? My weblog looks weird when viewing from my iphone 4. I’m trying to find a template or plugin that might be able to fix this problem. If you have any recommendations, please share. Thank you!